During early differentiation of Dictyostelium the attractant cAMP is released periodically to induce aggregation of the cells. Here we pursue the question whether pulsatile cAMP signaling is coupled to a basic Ca2+-oscillation. We found that the calmodulin antagonist W-7 transiently enhanced cAMP spikes. We show that W-7 acts on an acidic Ca2+-store: it abolished ATP-dependent vesicular acidification, inhibited V-type H+ATPase activity more potently than the weaker antagonist W-5 and caused vesicular Ca2+-leakage. 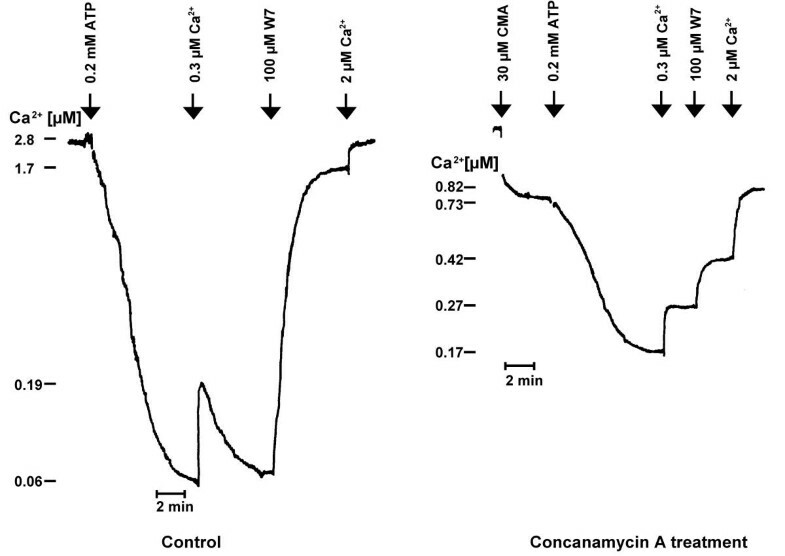 Concanamycin A, an inhibitor of the V-type H+-pump, blocked the Ca2+-leakage elicited by W-7 as well as cAMP-oscillations in the presence of W-7. Concanamycin A caused an increase of the cytosolic Ca2+-concentration whereas W-7 did not. In case of the latter, Ca2+ was secreted by the cells. In accord with our hypothesis that the link from Ca2+ to cAMP synthesis is mediated by a Ca2+-dependent phospholipase C we found that W-7 was not active in the phospholipase C knockout mutant. We conclude that the potentiation of cAMP relay by W-7 is due to a transient inhibition of the acidic Ca2+-store. The inhibition of the proton pump by W-7 causes a leakage of Ca2+ that indirectly stimulates adenylyl cyclase activity via phospholipase C.
The development of Dictyostelium discoideum to the multicellular stage and formation of fruiting bodies is largely determined by cAMP. During aggregation cAMP is required extracellularly to attract amoebae to the aggregation centre and intracellularly to activate PKA. PKA in turn is involved in an oscillatory loop of adenylyl cyclase activation as well as in gene regulation. Later in development, after tip formation, cAMP waves emitted from the tip regulate cell movement, whereas intracellular cAMP is necessary for differentiation of prespore and prestalk cells [for review see [1, 2]]. There are three distinct genes that encode adenylyl cyclases [3–6]. The main enzyme for aggregation (ACA) displays little activity in growing cells and accumulates during differentiation with a maximum at aggregation. If ACA is genetically inactivated cells do not aggregate. The second enzyme (ACRA) is required at culmination for sporulation and construction of the stalk but its mRNA accumulates to high levels after 4 h of starvation. Transcripts of the third class (ACG) are found during spore germination. Its activity is upregulated by high osmolarity and is essential for the maintenance of dormancy . The aggregative enzyme (ACA) is activated following cAMP-binding to the G-protein coupled cell surface cAMP receptor (cAR1). The signal is transmitted via Gβγ and a cytosolic activator protein named CRAC that is thought to mediate the function of Gβγ in stimulating ACA [for review see ]. Among further components of this regulatory loop are RasC , a MAP-Kinase ERK2  and RegA, a two-component signaling cAMP-phosphodiesterase [10, 11]. cAMP is secreted periodically after about 4 h of differentiation with a period length in cell suspension of about 7 min. cAMP oscillations are accompanied by oscillations of cGMP, Ca2+, K+ and H+. A basal extracellular Ca2+-oscillation is transformed to spikes during cAMP relay and continues after cessation of the latter [12, 13]. cAMP induces an influx of Ca2+ and a cytosolic Ca2+ transient [14–21]. Cytosolic Ca2+ is taken up into an IP3-sensitive Ca2+-store as well as into acidic Ca2+-stores [22–26]. Activation of plasma membrane Ca2+ATPase results in Ca2+-efflux which decreases during the course of differentiation [14, 27, 28] with a concomitant increase of sequestered Ca2+ . Ca2+-influx is strongly reduced in the IplA minus strain that should lack an IP3 receptor-like Ca2+-channel . One type of calmodulin antagonists, calmidazolium, was found to stimulate Ca2+-entry, to cause a cytosolic Ca2+-increase and to delay light scattering oscillation and cAMP relay [31, 32]. Calmidazolium, but not the other calmodulin antagonist W-7, blocked Dictyostelium calcineurin activity [, unpublished results]. In contrast to calmidazolium, W-7 inhibited Ca2+-influx, enhanced light scattering as well as cAMP oscillation. Since W-7 was the first known agent stimulating oscillations we investigated its mode of action. 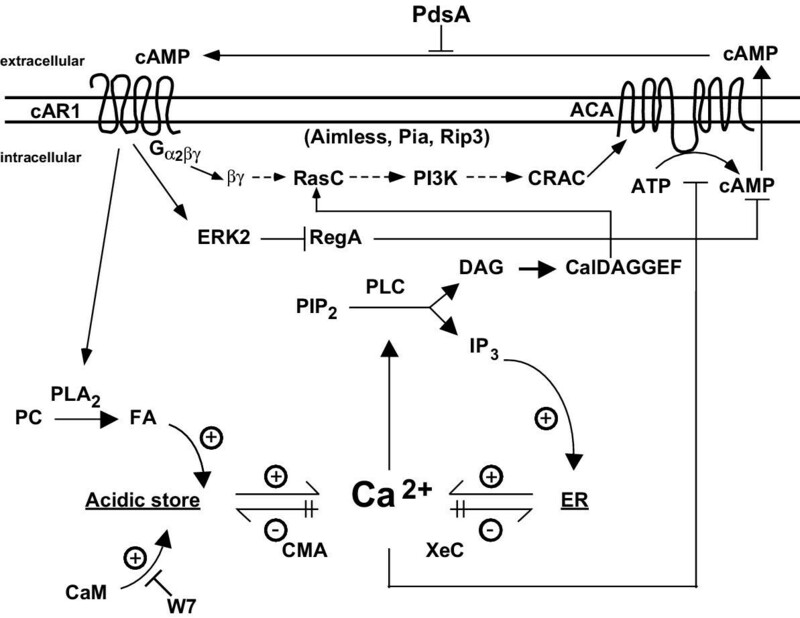 The results show that W-7 transiently inhibited the acidic Ca2+-store and that phospholipase C is required as a link of Ca2+ to cAMP oscillations. Dictyostelium cell suspensions start to oscillate at about 4 h after induction of differentiation. This can be measured by the light scattering technique or with a Ca2+-sensitive electrode. The light scattering oscillations coincide with cAMP relay and extracellular Ca2+-oscillations [34–36]. Oscillations start out with low amplitude and gain maximal height after 5 to 8 cycles due to feedback stimulation by extracellular cAMP. We found that the calmodulin (CaM) antagonist W-7 transiently enhanced light scattering oscillation amplitude when added early during oscillation (Fig. 1). W-7 addition also caused a phase advance indicating that W-7 interferes with the principal oscillator. Fig. 2 demonstrates that W-7 augmented cAMP relay and caused a phase advance in cAMP synthesis. 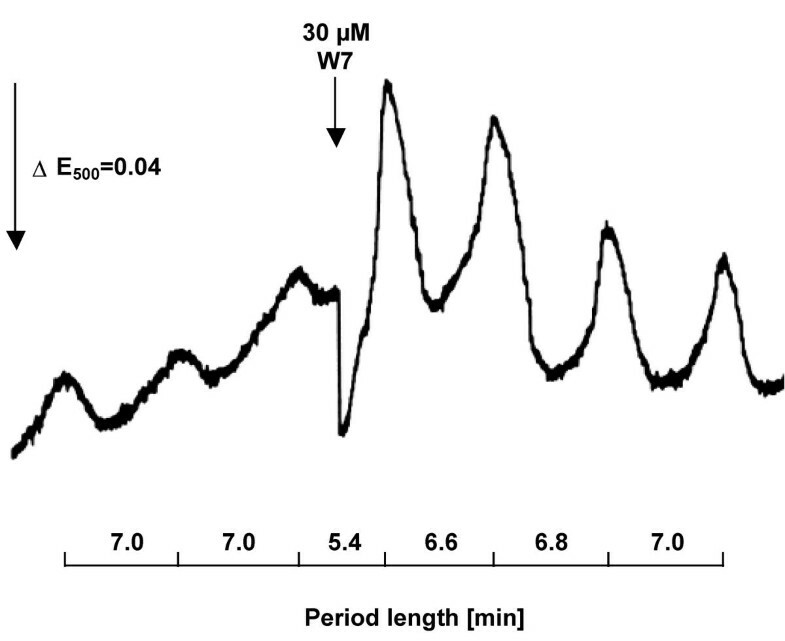 The effect of W-7 was most pronounced at the onset of oscillations with a 6.3 ± 2.7 fold (n = 3) increase in cAMP relay. Later on, smaller increases were measured (1.3 ± 0.1 fold, n = 3) because oscillation amplitude had reached their maximal values. In order to find the target of W-7, we first tested whether W-7 directly activates adenylylcyclase in cell lysates. In four separate experiments no significant alteration of the catalytic enzyme activity by W-7 could be detected (0.96 ± 0.25, n = 10). We then investigated the following processes that involve Ca2+. Early light scattering oscillations are enhanced by W-7. Free running oscillations of a cell suspension at 2 × 107 cells per ml were recorded using the light scattering technique as described in Material and Methods 4 h after induction of differentiation. 30 μM W-7 was added where indicated. One out of ten independent experiments is shown. Just starting cAMP oscillations are upregulated by W-7. cAMP concentrations were determined as described in Materials and Methods. 80 μl samples were withdrawn from the cell suspension before and after addition of 30 μM W-7. The peak cAMP value corresponds to 89 pmol/107 cells. One out of three independent experiments is shown. Addition of cAMP to a cell suspension induces a rapid transient Ca2+-influx [13–17]. 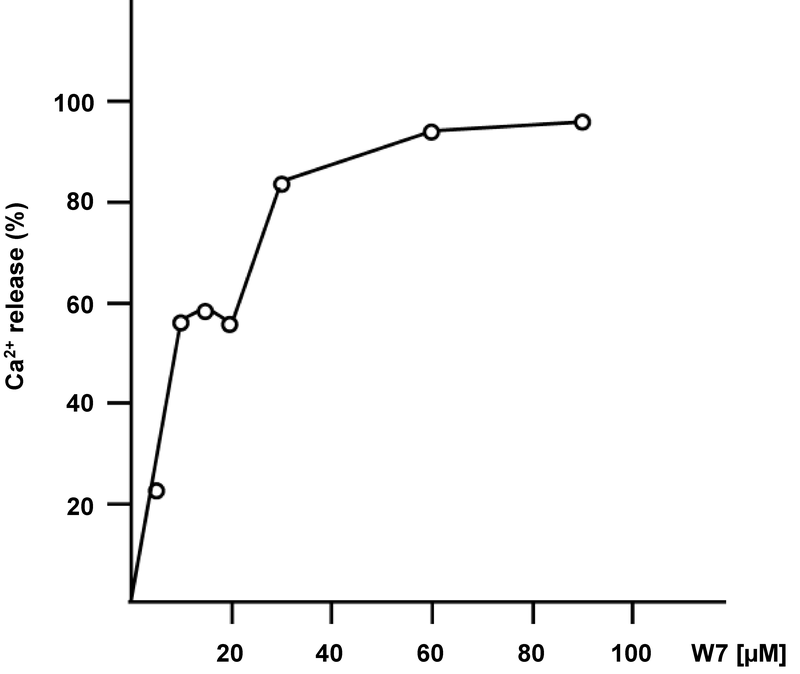 In the presence of W-7 cAMP-induced Ca2+-influx was reduced by 60–70% (Fig. 3). Maximal inhibition occurred at about 30 μM W-7. 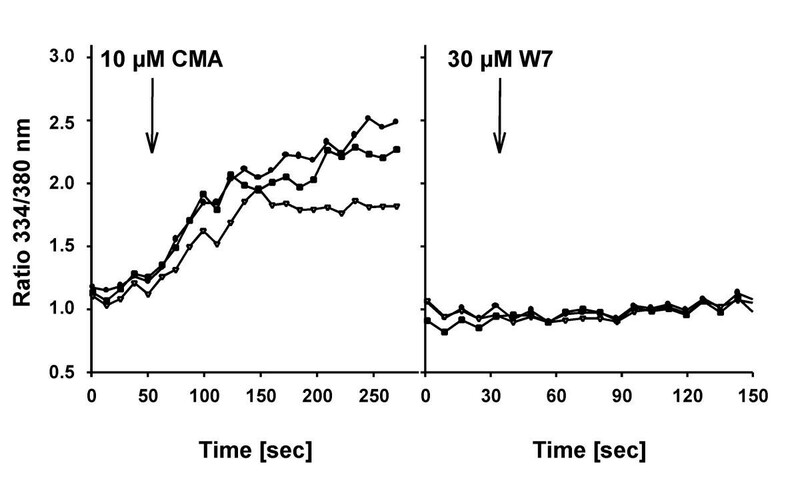 Dose response curve for inhibition of cAMP-induced Ca2+-influx in the presence of W-7. Each data point represents a separate experiment. Ca2+-influx was determined as described in Materials and Methods. The mean control influx was 165 ± 68 pmol per107 cells. The extracellular Ca2+-concentration was about 4 μM. Inhibition of Ca2+-influx is not sufficient as an explanation for the enhancement of oscillation amplitude by W-7. The IplA minus strain oscillated and responded to W-7 although receptor-mediated Ca2+-influx is strongly reduced (30, Fig. 4). The amplitude increased 1.8 ± 0.3 fold (n = 5) and cAMP 2.7 ± 0.5 fold (n = 3) following addition of 30 μM W-7. Light scattering oscillation of the IplA minus strain and its response to W-7. The experiment was performed as described in the legend of figure 1. Previously, we have shown that vesicular 45Ca2+-uptake was inhibited by a CaM antibody and CaM antagonists including W-7 . We now show that W-7 also induced substantial Ca2+-release (Fig. 5). A dose response curve revealed that 30 μM W-7 nearly saturated the response (Fig. 6). 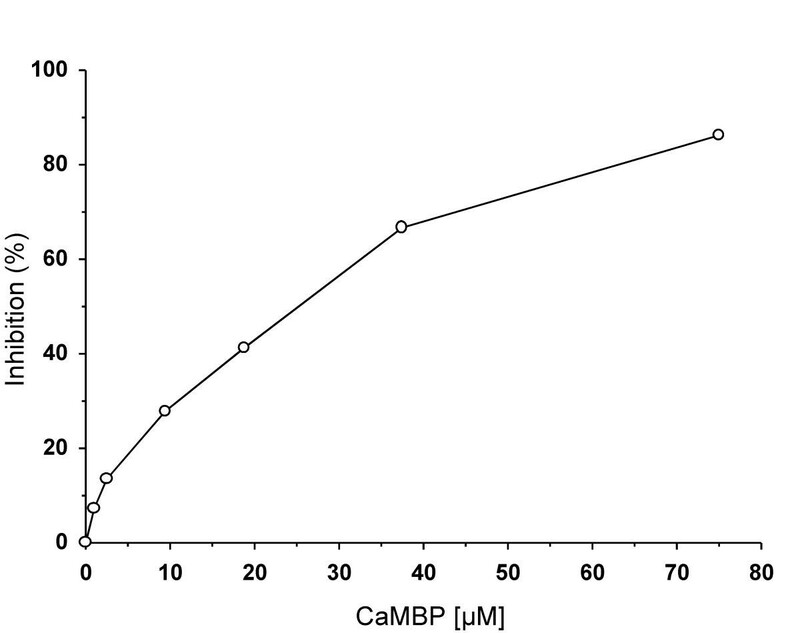 To examine whether CaM is involved we asked whether a peptide containing the CaM-binding domain of CaMKII (CaMBP) competes for W-7-induced Ca2+-release. We found that CaMBP dose dependently reduced the response to W-7. 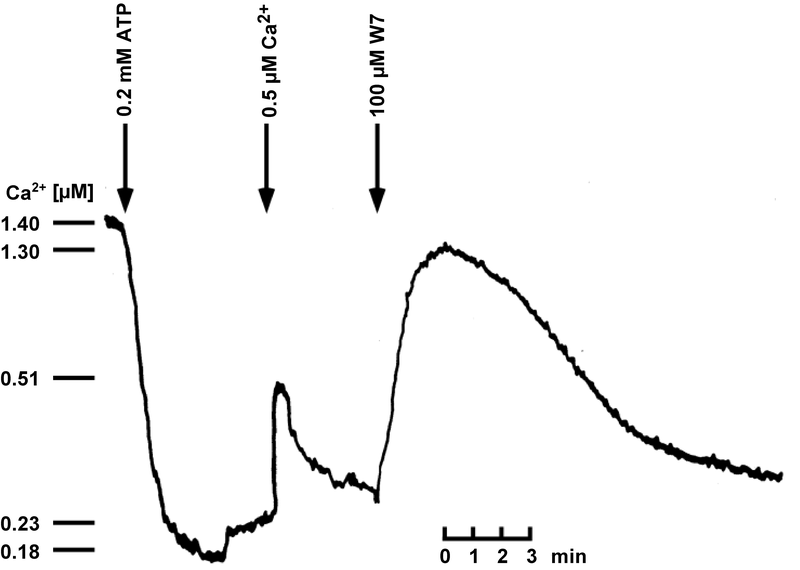 Half maximal inhibition occurred at about 20 μM of the peptide (Fig. 7). CaMBP also induced Ca2+-release albeit at a slower rate than W-7 (data not shown). Induction of vesicular Ca2+-release by W-7. Vesicular Ca2+-uptake was measured as described in Materials and Methods. Addition of 400 μM ATP initiated Ca2+-uptake. Following a Ca2+ calibration pulse W-7 was added. One out of ten independent experiments is shown. Dose response curve for W-7-induced vesicular Ca2+-release. The experiment was performed as described in the legend of figure 5. One out of two independent experiments is shown. 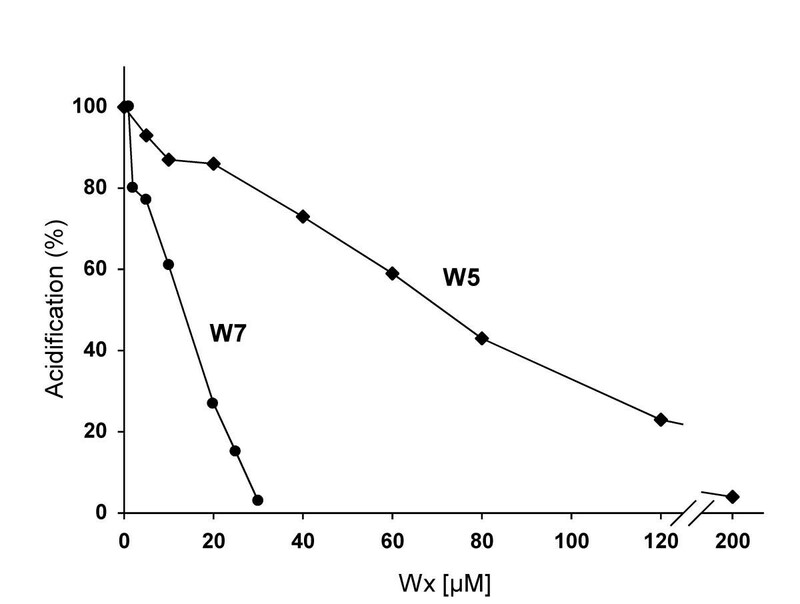 Dose response curve for inhibition of W-7-induced vesicular Ca2+-release by CaMBP. The experiment was performed as described in the legend of figure 4. 100 μM W-7 was added after preincubation of CaMBP with the vesicles for 10 to 15 min to allow for Ca2+-release elicited by CaMBP. 100% Ca2+-release amounted to 6 nmol Ca2+ per mg protein. One out of three independent experiments is shown. Dictyostelium cells contain at least two Ca2+-stores besides mitochondria and mass dense granules, the endoplasmic reticulum (ER) and an acidic Ca2+-store [22–26]. The acidic Ca2+-store contains a V-type H+ATPase that acidifies the vesicles. The proton gradient is used to transport Ca2+ into the store. In the presence of W-7 ATP-dependent acidification was abolished (Fig. 8). The half maximal concentration for W-7 was 16 ± 4 μM (n = 3). The less potent CaM antagonist W-5 was effective at a correspondingly higher concentration. Half maximal inactivation occurred at 50 ± 14 μM (n = 3). The graded potency of W-7 and W-5 to block ATP-dependent acidification supports the notion that the CaM antagonists act via CaM. To find out whether CaM regulates the H+-pump we measured V-type H+ATPase activity in the presence of W-7 or W-5. 90 μM W-7 or W-5 reduced enzyme activity (3.7 nmol Pi/min·mg) by 34 ± 3% and by 9.7 ± 5% (n = 3), respectively. Measurement of H+ATPase activity requires 30 min of incubation. The incomplete inhibition of the ATPase is probably the reason for the transient effect of W-7 on light scattering oscillation. Inhibition of ATP-dependent vesicular acidification by CaM antagonists. Determination of ATP-dependent acidification was performed as described in Material and Methods. Control acidification amounted to 20 relative fluorescence units. One out of three independent experiments is shown. If W-7 acts on the acidic store inhibition of the H+ATPase should eliminate or potently reduce the response to W-7. A potent inhibitor of the V-type H+ATPase is concanamycin A (CMA). We found that preincubation with CMA reduced both, vesicular Ca2+-uptake and W-7-induced Ca2+-release (Fig. 9). Ca2+-uptake was inhibited by 64 ± 9% (n = 3), Ca2+-release by 86 ± 2% (n = 3). These results show that the acidic Ca2+-store accounts for 65% of vesicular transport. Blockade of the proton pump abolished Ca2+-release induced by W-7. The occurrence of Ca2+-release can thus be explained by leakage of Ca2+ from the store due to transient inhibition of the proton pump. Vesicular Ca2+-uptake and W-7-induced Ca2+-release in the absence or presence of CMA. The experiment was performed as described in the legend of figure 5. 30 μM CMA was added 2 min before ATP addition (right panel) the control received the solvent DMSO (left panel). One out of three independent experiments is shown. Since W-7 and CMA act on the H+-pump and W-7 enhances cAMP synthesis we wondered whether CMA influences cAMP relay. We measured light scattering and cAMP concentrations before and after application of CMA and W-7. We found that after CMA application, oscillation continued for one cycle and then ceased. Addition of W-7 caused a small increase in light scattering but cAMP relay was blocked (Fig. 10). In 3 independent experiments inhibition of cAMP relay amounted to 92 ± 5%. Light scattering and cAMP oscillation in the presence of CMA and W-7. The experiment was performed as described in the legend of figure 2. cAMP concentration were measured before the addition of CMA and after the addition of W-7. The results are expressed as xfold increase in cAMP concentration. One out of three independent experiments is shown. We have shown that W-7 caused vesicular Ca2+-leakage. Does this result in an increase of [Ca2+]i? 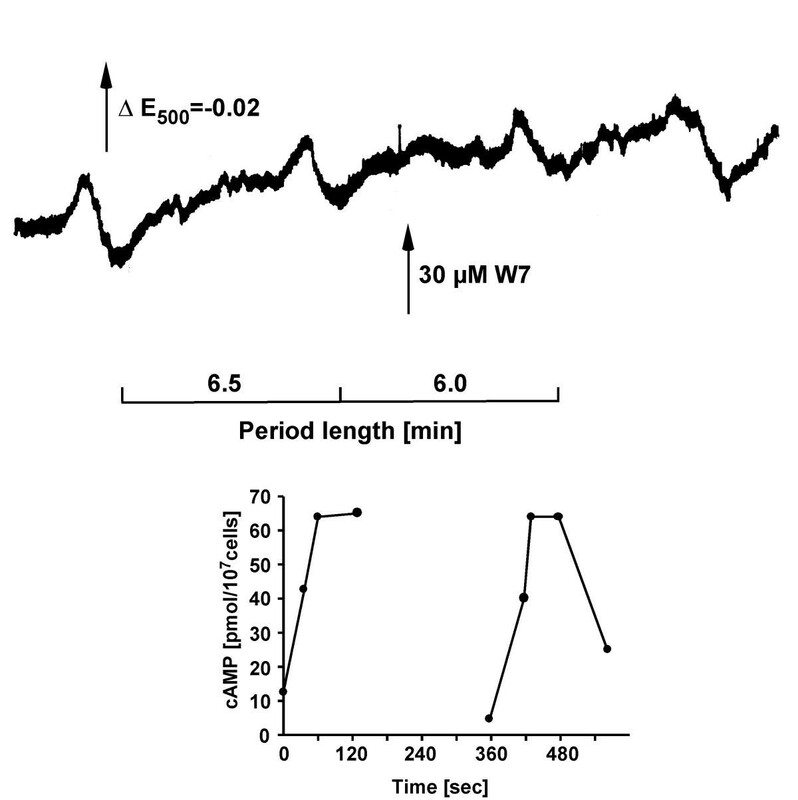 In 210 cells analyzed 30 μM W-7 did not cause a cytosolic Ca2+-concentration change. By contrast, CMA raised [Ca2+]i, indicating that CMA acts more potently on the H+-pump than W-7 (Fig. 11). However, W-7 elicited Ca2+-efflux from cells. The efflux amounted to 1.6 ± 0.5 nmol/107 cells (n = 8). If we compare efflux with leakage from the acidic Ca2+-store which amounted to 13.0 ± 4, 8 nmol/mg protein (n = 8) and account for a six-fold enrichment of Ca2+-stores in the vesicle preparation with respect to cells (1 × 107 cells contain 1 mg protein) the 13 nmol reduce to 2.2 nmol/mg protein. Thus, the most part (1.6/2.2 = 72%) of W-7-induced Ca2+-leakage is secreted by the cells. Cytosolic Ca2+-concentration in the presence of CMA or W-7. Single cells were loaded with Fura-2-Dextran and the fluorescence ratio was measured as described in Materials and Methods. One out of three independent experiments is shown. In order to find out whether the Ca2+-activated phospholipase C (PLC) of Dictyostelium represents a link to cAMP relay we analyzed the PLC null strain HD10, for light scattering and cAMP oscillations. In HD10, light scattering amplitudes contain a negative component as compared to Ax-2 (Figs. 1,2,9). 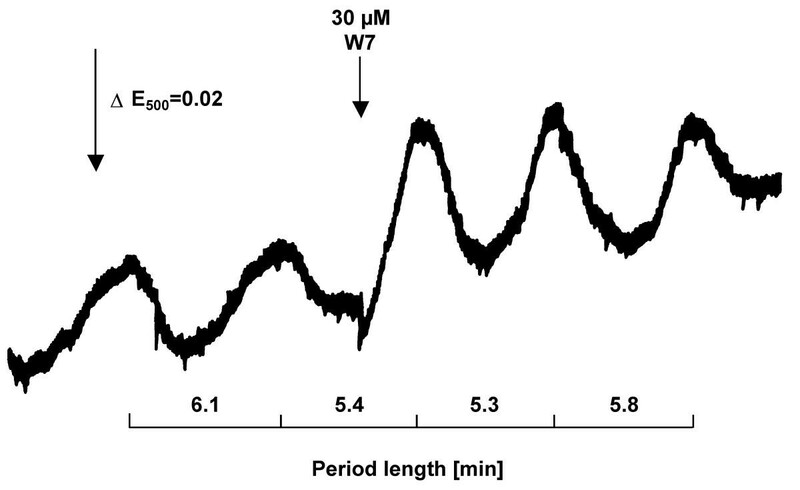 W-7 neither elicited an increase in light scattering amplitude nor in cAMP relay (Fig. 12). In four experiments only 76 ± 22% (n = 4) of the previous control amplitude of cAMP synthesis was measured. The parental strain of HD10, Ax3, responded to W-7 with a 2.8 ± 0.6 fold (n = 6) increase in light scattering amplitude and did not show a negative component in light scattering oscillations (data not shown). Light scattering and cAMP-oscillation of the phospholipase C-null-strain, HD10. W-7 was added were indicated. Note that the light scattering change underlying cAMP relay is negative. The experiment was performed as described in the legend of Fig. 2. The occurrence of oscillations in the PLC null strain can be explained by an IP5-phosphatase that hydrolyses IP5 to yield IP3. The phosphatase is also activated by Ca2+ but requires higher concentrations [37–39]. The Ca2+-binding protein CaM regulates many proteins and enzymes in mammalian cells but in Dictyostelium only few targets in signal transduction are known: calcineurin, a CaM-dependent protein kinase, and the contractile vacuole [33, 40, 41]. Neither the cyclases, nor the phosphodiesterases, PLC or the plasma membrane Ca2+ ATPase were reported to be regulated by CaM [1, 27]. Therefore, it came as a surprise that the CaM antagonist W-7 enhanced light scattering spikes and cAMP relay. The spike-shaped light scattering response, as an indicator for cAMP relay, saturated at 30 μM W-7. 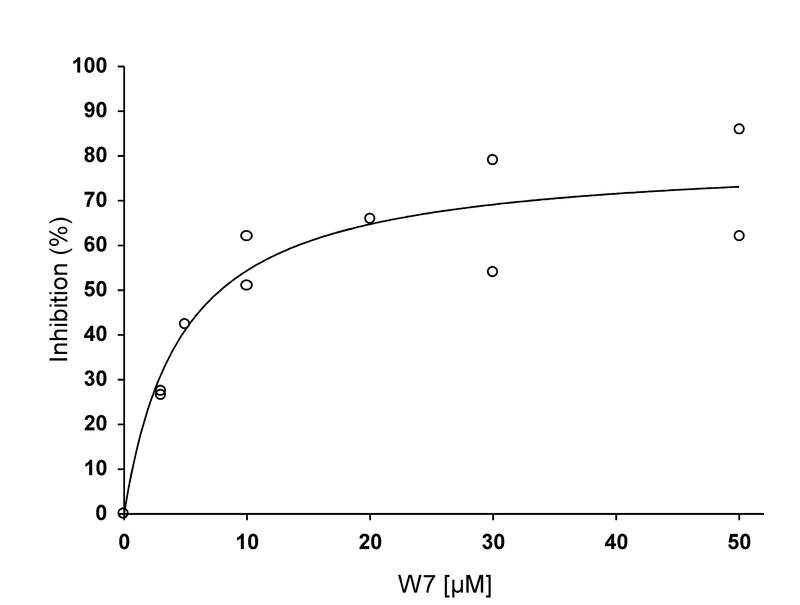 The reported IC50 value for W-7 as an antagonist for CaM is 25 μM [42, 43] indicating that the effective concentration of W-7 matches with known CaM-targets. In mammalian cells a variety of ion channels are regulated by CaM. Indeed, W-7 inhibited cAMP-induced Ca2+-influx (Fig. 3). However, in the IplA minus mutant, where receptor-mediated Ca2+-influx is almost absent, W-7 still augmented light scattering spikes and cAMP relay. This result excludes inhibition of Ca2+-influx as the main cause for the effect of W-7. W-7 seems to antagonise CaM since W-5 was less potent than W-7 and a CaM-binding peptide dose dependently inhibited the Ca2+-response of W-7 (Fig. 7). CaM was shown to be located to the contractile vacuole, an organelle thought to be identical with or at least part of the acidic Ca2+-store [41, 44]. 1. CMA is lipid soluble and targets the Vo-portion of the H+ATPase. By contrast, W-7 is fairly water soluble and seems to inhibit the H+ATPpase indirectly via CaM. 2. The effect of CMA is long lasting (Figs. 9,10) whereas the effect of W-7 is transient (Fig. 1,5). 3. 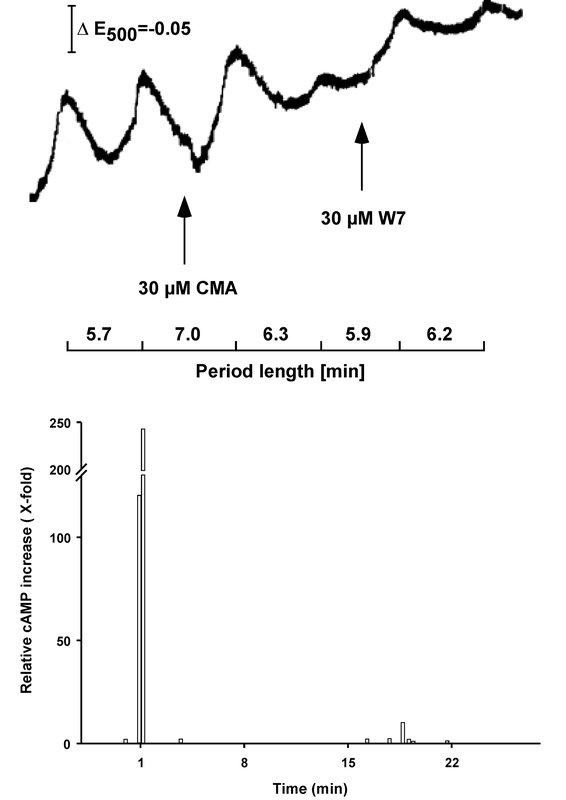 CMA elicits an increase of the cytosolic Ca2+-concentration whereas W-7 does not (Fig. 11). A likely explanation for the different outcomes could be that W-7 acts on the acidic stores located at or near the plasma membrane. This would explain why Ca2+-release can be measured extracellularly and not as a global, cytosolic Ca2+-increase. The Ca2+-released, close to the plasma membrane, however, could still activate PLC [37, 38]. How could the Ca2+-oscillation be regulated? Previously, we have shown that signal transduction elicited by extracellular cAMP is mediated by phospholipaseA2 activity: the fatty acids liberated induce Ca2+-release from the acidic Ca2+-store  as shown in Fig. 13. Ca2+ may stimulate a positive feedback loop by activation of PLC. One of the products, IP3, elicits Ca2+-release from the ER that may accumulate in the acidic store thereby completing the oscillatory cycle. Alternatively, PLC activity is reinforced. DAG, the second product of PLC, represents a link to adenylyl cyclase activity. In principle, cAMP levels could be raised likewise by inhibition of phosphodiesterase activity, for instance via phosphorylation by a DAG-dependent PKC. However, the peak of cAMP relay occurs earlier after W-7 application (Fig. 2). This shift cannot be due simply to a reduction in degradation of cAMP. In mammalian cells CalDAG-GEFs are known to activate Ras . In Dictyostelium, RasC activity is required for adenylyl cyclase activity (ACA) . Direct regulation of ACA by Ca2+ which occurs in two types of mammalian adenylyl cyclases (I-AC and VIII-AC) seems unlikely in Dictyostelium since no EF hand nor CaM binding site has been reported. The same holds true for other regulators of ACA, namely Pianissimo , RasGEF (Aimless) , CRAC and RipA . Hypothetical scheme for Ca2+-oscillations in Dictyostelium and a link to adenylylcyclase. Adenylylcyclase was shown to be activated by Gβγ, rasC, and CRAC. PI3K activity provides for PIP3 allowing cytosolic CRAC to bind to the plasma membrane. Aimless and RipA are thought to act in concert with rasC. The direct target of pianissimo is not yet known nor the detailed sequence of events leading to cAMP synthesis. ERK2 stimulation by cAR1 is independent of rasC . ERK2 inhibits RegA, a cytosolic phosphodiesterase. cAR1 also activates phospholipase A2 that liberates fatty acids (FA) and elicits Ca2+-influx [17, 26]. Ca2+ released by fatty acids from the acidic store activates a positive feedback loop via PLC activity. IP3 stimulates Ca2+-release from the ER, thereby raising cytosolic Ca2+ and enhancing PLC activity. Ca2+ sinks are provided by Ca2+-uptake into the ER and the acidic Ca2+-store. Inhibition of either pump, the Ca2+-pump by XeC or the H+-pump by CMA leads to an increase of [Ca2+]i and to a blockade of Ca2+-oscillation as well as cAMP relay . ACA is suggested to be activated by a CalDAG stimulated exchange factor acting on RasC. cAMP released to the outside of the cell elicits feed back stimulation during oscillation in cell suspension. Extracellular phosphodiesterase (PdsA) provides for a low extracellular cAMP level allowing sensitive detection of the next wave. We have shown that disturbing the function of the acidic Ca2+-store leads to inhibition of light scattering oscillation and cAMP relay. We have obtained the same result by inhibition of the other Ca2+-store with Xestospongin C (XeC), a drug which, in Dictyostelium, inhibits the Ca2+-pump of the ER . Both drugs led to an increase of the cytosolic Ca2+-concentration. A basic conclusion is that the oscillatory behaviour of Dictyostelium depends on both Ca2+-stores. Extracellular Ca2+-oscillations occur simultaneously with light scattering and cAMP oscillations . 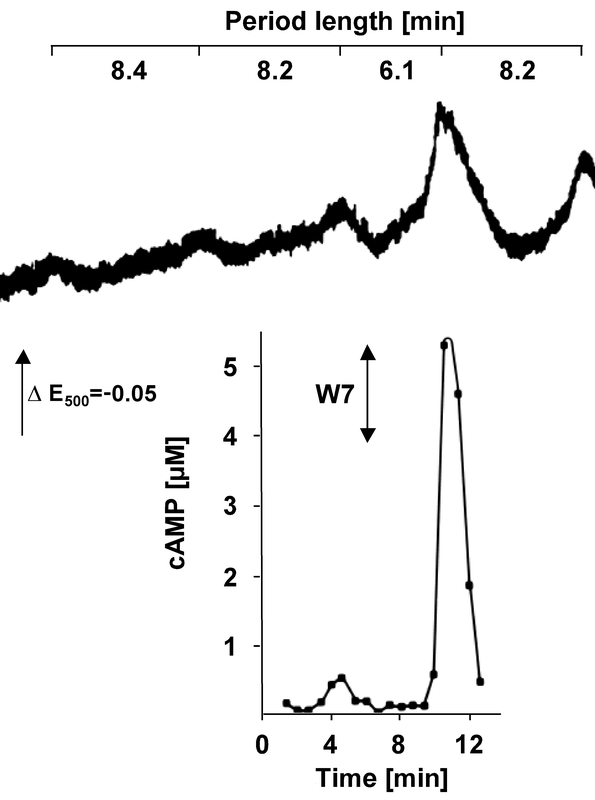 The phase advance induced by the calmodulin antagonist W-7 suggests that W-7 interferes with an internal Ca2+-oscillation to which light scattering changes and cAMP production are coupled. When the cytosolic Ca2+-concentration remains elevated above the basal level as found in case of inhibition of Ca2+-uptake by XeC or CMA, an hitherto unknown target seems to mediate inhibition of ACA. A possible candidate could be CaM Kinase II which is known to inhibit mammalian adenylyl cyclase III in vivo . We postulate that ACA can be regulated twice by Ca2+ during the oscillatory cycle, at least at its onset. A localised Ca2+-increase stimulates ACA whereas an elevated cytosolic Ca2+-concentration inhibits enzyme activity. A likely candidate mediating the activating Ca2+-link to ACA activity is PLC as shown in Fig. 13. As soon as cAMP oscillations are fully developed, the extracellular loop, that is: cAMP released by the cells binds to the cAMP receptor and reinforces signal transduction, provides for stimulation of cAMP synthesis and enhances Ca2+-oscillations. This is true for the wild type and for the PLC null strain. Under this condition, W-7 augmented spike-shaped light scattering oscillations and cAMP relay only to a small extent. However, the regulatory link persists to a later stage (sinusoidal light scattering oscillations) where cAMP relay is absent. W-7 even then restarted spike-shaped light scattering oscillations (unpublished). As stated above, in the absence of PLC a Ca2+-sensitive IP5-phosphatase hydrolyses IP5 to yield IP3. Thus Ca2+-oscillations still occur (unpublished results) but is there a link to cAMP synthesis although DAG is not provided for by IP5-phosphatase? In order to obtain cAMP oscillations the extracellular loop, that is restimulation of cAR1 by extracellular cAMP, might be sufficient. Alternatively, a hitherto unknown Ca2+-sensitive mechanism exists that is independent of DAG. We know that PLC null cells display a reduced sensitivity to FA for Ca2+-influx  indicating that the sensitivity to Ca2+ may have changed in the strain. This result is in accord with the lower Ca2+ affinity of the IP5-phosphatase as compared to PLC. Therefore it is not unlikely that another pathway to cAMP production is open. Unexpectedly, the CaM antagonist W-7 augmented pulsatile cAMP relay in Dictyostelium. We found that W-7 caused Ca2+-leakage by transient inhibition of the V-type H+-pump. A target of Ca2+ is phospholipase C. A PLC-null-mutant failed to respond to W-7. Inhibition of the acidic Ca2+-store by CMA blocked the effect of W-7 on Ca2+-leakage and cAMP relay. We conclude that a basal Ca2+-oscillation regulates cAMP synthesis (Fig. 13): Ca2+-released by one of the stores activates PLC. IP3 reinforces Ca2+-release and PLC-activity. The Ca2+-signal is terminated by transport into the stores. DAG may stimulate adenylyl cyclase activity via RasC. cAMP in an extracellular loop triggers receptor-mediated fatty acid release that in turn causes Ca2+-release from the acidic store thereby enhancing the cycle. N-(6-aminohexyl)5-chloro-1-naphthalene sulfonamide (W-7), N-l-(6-aminohexyl)naphthalene sulfonamide (W-5) and concanamycin A were from Fluka, Buchs, Switzerland. Fluo-3, Fura-2 and Fura-2-Dextran were purchased by MobiTec, Göttingen, Germany, and calmodulin binding peptide of CaMKII by Calbiochem, Bad Soden, Germany. The axenic strain Ax2 and the phospholipase C-null-mutant, HD10, kindly provided by P.J. Van Haastert, University of Groningen, The Netherlands, were grown in shaking culture as described [50, 51]. Differentiation was induced by washing the cells twice in ice-cold Sørensen phosphate buffer (17 mM (KH2/Na2H)PO4, pH 6.0). Cells were shaken on a rotary shaker at 23°C, 150 rpm at 2 × 107 cells/ml until use. 20 ml 2 × 107 cells/ml were shaken in Sørensen phosphate buffer containing 5 mM EGTA for 2–4 h, washed once in ice-cold 20 mM Hepes buffer, pH 7.2, resuspended at 2 × 108 cells/ml, and lysed by passage through nuclepore filters. Immediately, 3% sucrose, 50 mM KCl, 1 mM MgCl2, 10 μg/ml leupeptin, 1 μg/μl aprotinin and 1.25 mM dithiothreitol were added (final concentration). After centrifugation for 5 min at 150 × g in order to remove unbroken cells, the supernatant was further fractionated by centrifugation for 5 min at 3800 × g. The sediment (Po) was resuspended in 1 ml 10 mM Tris buffer, pH 7.8, 3% sucrose, 50 mM KCl, 1 mM MgCl2, 20 μg/ml leupeptin and 2 μg/ml aprotinin yielding a protein concentration of 2.6 ± 0.5 mg/ml (n = 19). Po contained part of the ER and the acidic vesicle fraction with about 70% of the Ca2+-transport activity. Ca2+-transport was measured essentially as described . In brief, about 60 μl Po was added to 10 mM Hepes, pH 7.2, 50 mM KCl, 3% sucrose, 6 μg/ml antimycin A, 6 μg/ml oligomycin A, 100 μM NaN3, 2 mM MgCl2, and about 0.5 μM Fluo-3 in a total volume of 1 ml. Ca2+-uptake was initiated by addition of 400 μM ATP. Fluo-3 fluorescence was monitored at 505 nm excitation and 526 nm emission with a fluorimeter (Perkin Elmer 650–10S, Überlingen, Germany). Statistical data are expressed throughout as the mean ± S.D. Cells were loaded with the Ca2+-indicator Fura-2-Dextran by electroporation . After a wash in 5 mM Hepes, 5 mM KCl, pH 7.0 (H5 buffer), 10 μl aliquots of cell suspension were placed on cover slips and incubated in a humid chamber. At 10 min before [Ca2+]i recordings buffer covering the cells was replaced by 90 μl of fresh H5 buffer with or without Ca2+, as indicated. [Ca2+]i imaging was performed on an Axiovert F100 TV (Zeiss, Jena, Germany). The cells were viewed with a 100 × Fluar objective (NA1.3). 334 and 380 nm excitation was performed with a mercury lamp and a rotating filter wheel. Images of the cells were recorded with an ICCD Camera (HL-A; Proxitronic, Bensheim, Germany). Image digitization and calibration were as described previously . 70 μl of 3 h starved cells (2 × 107 cells/ml) were added to 930 μl Sørensen phosphate buffer, pH 6.0, containing 1.6 μM of the fluorescent Ca2+-indicator Fura-2. Cells were stirred at 23°C and fluorescence emission was recorded at 510 nm and excitation wavelengths of 340 nm and 380 nm with a Perkin Elmer fluorimeter. Ca2+-concentrations were calculated as described . Following equilibration of the external Ca2+-concentration to about 0.3 μM Ca2+ 30 μM W-7 was added. Ca2+-efflux occurred within about 4 min and was calibrated by additon of known amounts of Ca2+. Acidification was measured by fluorescence quenching of the weak base acridine orange (480 nm excitation, 528 nm emission) according to Rooney and Gross . 80 to 150 μg protein were assayed in 1 ml buffer containing 10 mM Hepes buffer pH 7.2, 50 mM KCl, 3% sucrose, 2 mM MgCl2, 2 μM acridine orange, and 6 μg/ml antimycin A, 6 μg/ml oligomycin A, 100 μM NaN3 in order to inhibit mitochondrial activity. Since Po contained vesicles with ATP-independent acidification the supernatant was used after centrifugation for 10 min at 5800 × g. Acidification was started with 1 mM ATP. Ca2+-influx was determined with a Ca2+-sensitive electrode , and light scattering oscillations were recorded as described . The amount of cAMP (intracellular and extracellular) present during oscillations in the presence or absence of drugs was measured using an enzyme immunoassay (Biotrak, Amersham Pharmacia Biotech). Samples were prepared as described . V-type H+ATPase activity was determined as described previously . Adenylyl cyclase assays in cell lysates were performed essentially as described . cAMP levels, determined by enzyme immunoassay, amounted to 11–85 pmol cAMP per min per mg protein. Protein concentrations were determined with the Coomassie protein assay reagent (Pierce) using bovine serum albumin as standard. We thank E. Jaworski, U. Eichert and D. Horak for expert technical assistance, Dr. R. Schaloske for helpful discussions and the Deutsche Forschungsgemeinschaft for support. DM conceived the study, participated in its design and coordination and performed Ca2+-transport experiments. DFL participated in the design of the study and carried out the cAMP relay studies. CS participated in the design of the study and performed cytosolic Ca2+-measurements. All authors read and approved the final manuscript.